Present state: Demolished - only a few brick remnants remain. The stationmaster's house is extant. 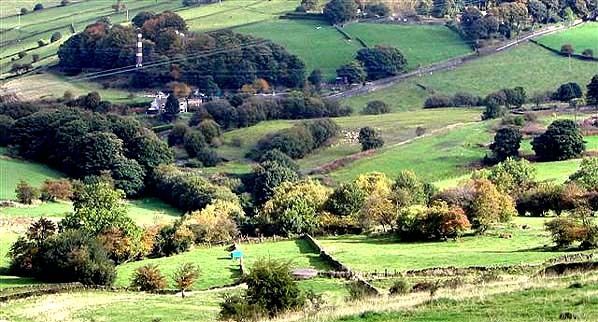 Notes: The line from Bradford to Thornton via Queensbury was opened as a joint venture between the Lancashire & Yorkshire Railway and the Great Northern Railway between 1876 and 1878. Once out of Bradford, the line was mostly rural and necessitated the construction of many earthworks, viaducts and tunnels. Its hilly nature earned it the nicknames of 'the Alpine route' or 'the switchback' from its loyal drivers. Although the National Archive record the station as opening 14.4.1897 it appeared in Bradshaw before the end of 1878 but the first stopping train is shown as May 1879. Queensbury station was fairly unique, having a triangular layout with platforms serving all three directions; the only other local example is Shipley, which only covered two sides of the triangle until the 1980's. 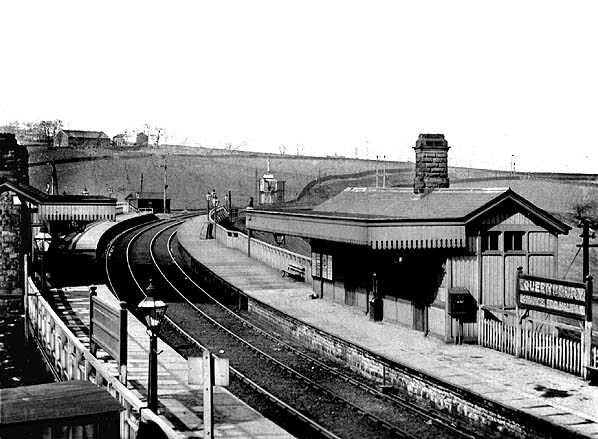 When the 'new' Queensbury station was opened in 1.1.1890, only Ambergate in Derbyshire had a similar layout. 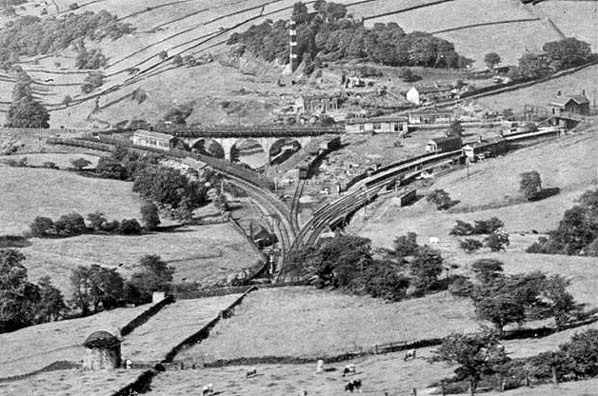 in all three directions from Bradford to both Halifax and Keighley and between Halifax and Keighley, and certain of these trains connect at Queensbury, although traffic here is considerably less than in days before bus competition robbed the railway of many of its passengers. The station is remarkable in having six independent sets of railway offices, all of them timber structures of typical Great Northern outline which include waiting rooms and lavatories; in addition, a booking office and other station buildings stand on an overbridge at the Bradford corner of the triangle. Platforms for the most part and platform fences almost entirely, are of timber, and timber maintenance must have been a considerable item in relation to the modest traffic now handled at the station. The Bradford – Keighley side of the triangle is carried in part on a three-arch stone and masonry viaduct; and at the Halifax end a subway is provided to connect the four platform ends. A passenger entering the station for a train to Halifax or Keighley may find, if it is a through Halifax – Keighley train that he has to walk the full length of a platform and half the length of another in order to reach it." was of more use as an interchange between the three lines. 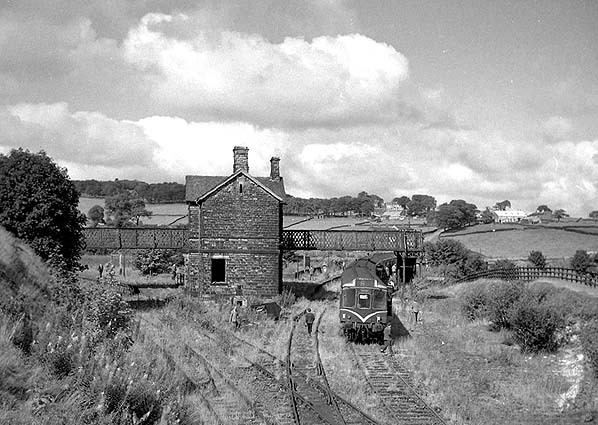 Goods services were minimal, being a few small coal mines which closed fairly early in the station's history and a local brickworks; the striped chimney of which serves as a convenient landmark in the photographs. 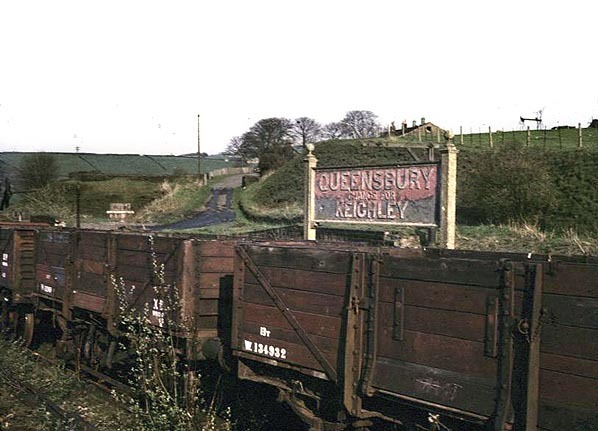 Upon leaving Queensbury for Halifax, trains had to enter the Queensbury tunnel underneath the village. At 1 mile 741 yards long, this was the fourth longest tunnel in West Yorkshire. Water seepage in the tunnel was always a problem and the subsequent damage to the tunnel lining was cited as one of the reasons for the closure of the line. Towards the end, enormous icicles forming in the tunnel in winter caused damage to trains, so a small engine had to be parked in the tunnel at night producing enough steam to melt the ice. 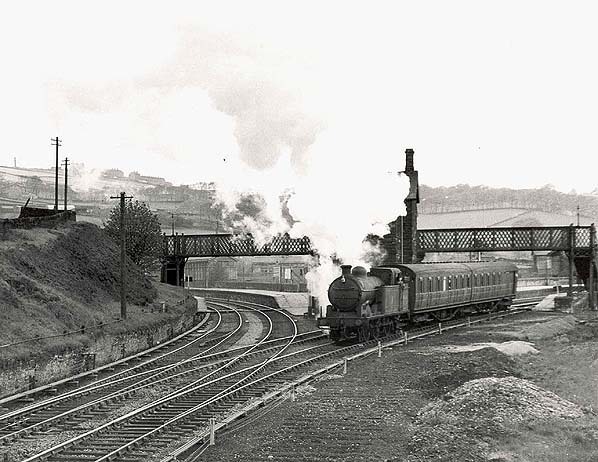 All passengers services were withdrawn on 23rd May 1955 but the station remained open for goods traffic until 11th November 1963 although after closure to passengers it was downgraded to an unstaffed public delivery siding. After complete closure of the station there was still some through goods traffic and the last passenger train to call at the station was the West Riding Railtour on 6th September 1964. The track was finally lifted back to Horton Park in June 1966.
eventually demolished c.2004, possibly for the valuable Yorkshire stone used in its construction. In May 2005 a section of the railway was brought back to life as the Great Northern Trail. 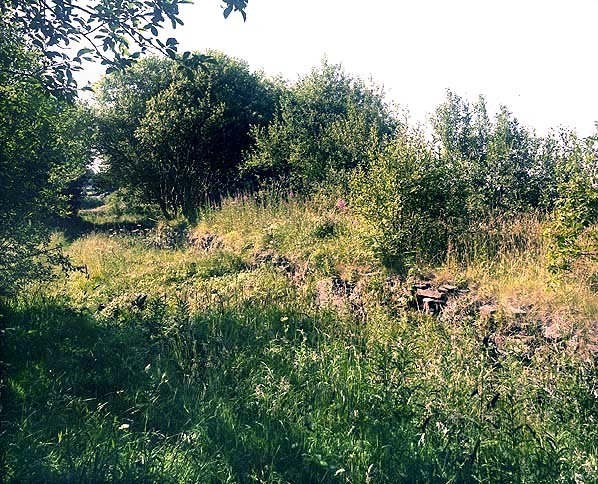 The first section of the new trail runs from Cullingworth to Harecroft Eventually the new trail will cover a distance of 10 kilometres between Queensbury and Cullingworth but it will be five years before it is completed. Further reading: The Queensbury Triangle by Alan Whittaker 1979. 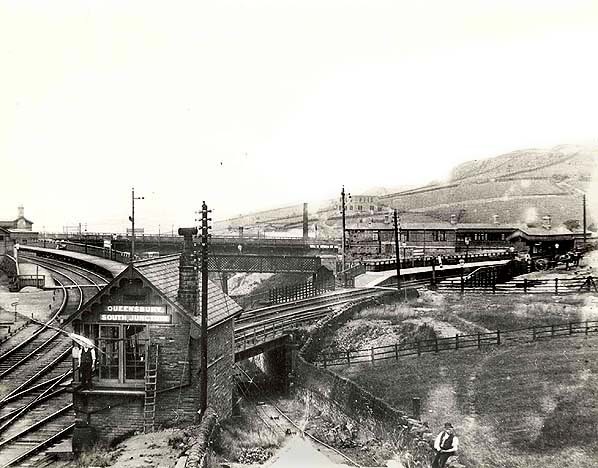 An early view of the Queensbury tunnel end of Queensbury station with the lines to Keighley diverging to the left and those to Bradford to the right. The viaduct carries the line from Keighley to Bradford over the Hole Bottom area. In the foreground a cable hauled colliery incline from the Hole Bottom Pit can be seen diving under the railway on its route down to the pit. Platforms to the right served Bradford Exchange and those to the left served Keighley. 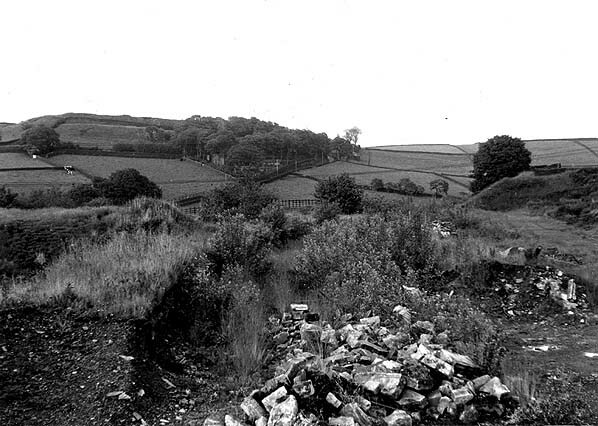 Queensbury triangle seen from above the tunnel in the 1960s. Queensbury South Junction is in the foreground. is seen in the centre. 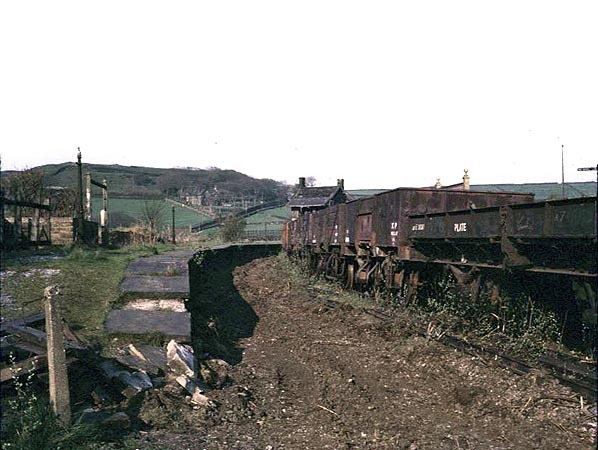 Degraded remains of Bradford - Halifax platforms looking south in June 1972.